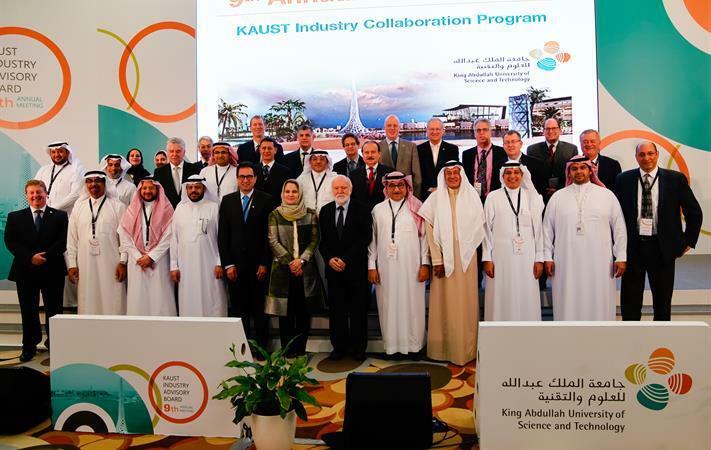 On February 21 and 22, the 9th annual meeting of the KAUST Industry Advisory Board (KIAB) took place on the University’s campus. The meeting puts research, education and economic development at the center of a two-day discussion with industry partners that aims to identify avenues of collaboration with and between members of the KAUST Industry Collaboration Program (KICP). KIAB, which was chaired this year by KAUST Interim President Nadhmi Al-Nasr, consists of executive-level industry representatives who convene to discuss the latest research activities at KAUST. “We are creating a culture of excellence and building an ecosystem that links science and research to economic development,” Al-Nasr said. The meeting is an opportunity for KAUST Industry Collaboration Program (KICP) members to provide suggestions on research relevant to industry needs. Members include both Saudi and international organizations with a focus on advancing research and development in the Kingdom. This year’s meeting saw the introduction of Dr. Kevin Cullen, the new KAUST vice president for Innovation and Economic Development. Cullen has assumed the management, development and commercialization of the University’s intellectual property portfolio. He is charged with helping to create and support new businesses and joint ventures and collaborations with industry partners, and he will help continue to foster the strong culture of entrepreneurship that KAUST has become known for. Dr. Najah Ashry, vice president of KAUST Saudi Affairs, spoke about social responsibility as one of the foundational aspects of the University’s mission. “In Saudi Arabia, it is very important to look at corporate social responsibility in the context of Vision 2030. We are inspired, encouraged and supported to focus on contributing to society and giving back to the community. We do this by creating opportunities for young men and women,” she said. Speaking on day two of the event, Dr. Khaled H. Biyari, CEO of the Saudi Telecom Company, discussed the need for a thriving digital economy. According to Biyari, the key is in fostering disruptive innovation in both the industrial and government sectors. “We are living in the fourth industrial revolution, and we should be aware of technology’s high phase and its impact on individuals, industry and governments,” Biyari said. Biyari also spoke about STC’s technological efforts enabling the company to compete on an international scale with other world leading technology companies. “We want to help bridge the gap between academia and industry and create an interesting partnership between STC and KAUST,” Biyari said. KAUST recognized this bridge as an important step in fulfilling its mission to address global challenges and provide many opportunities for business engagement, research commercialization and economic development. This article was originally posted on the main KAUST website. Learn more about the KICP program here. This entry was posted in Industry collaboration. Bookmark the permalink.